Is this the future of the sneaker/trainer box? Let’s face it they have to come in something. I quite like my trainer boxes and the stuff that is contained inside, but I also know that the current distribution model is not sustainable and something has to change. 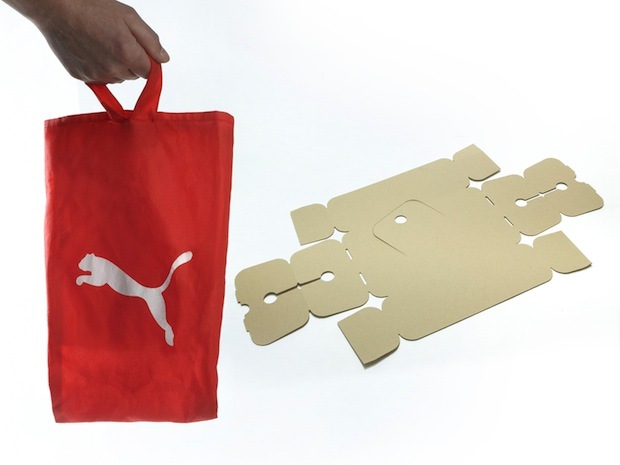 Puma and Yves Béhar have spent almost 3 years developing their version of what this might be. The result is the ‘Clever Little Bag’. Isn’t it nice? As a customer you get a nice keep sake if you so desire with the red tote bag, but more importantly everything is recyclable and the reduction in cardboard is 65% less than standard boxes. Would’nt it be nice if all sports brands used this form. Somewhat like if all the mobile handset manufacturers got together 10 years ago and decided on a universal form of charger, we wouldnt have the millions and billions of useless chargers getting dumped on landfill sites the world over. Somehow though, I can’t see Puma wanting to share this with their rivals, and who would blame them.